Rotherham investor E V Waddington Limited is finding early success as it progresses plans for more speculative commercial development at Dinnington in Rotherham. 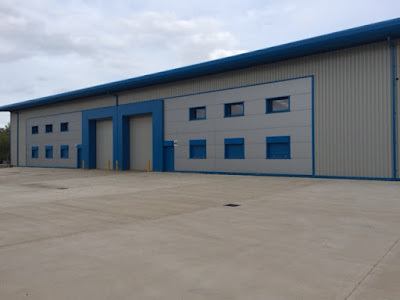 A leader in speculative development, Waddington has been based in Rotherham and for over 80 years have been providing the region with industrial, commercial and office accommodation to let. It acquired a parcel of land from at the former colliery site from the Homes & Communities Agency (HCA) in 2013 and is bringing forward further industrial units. The 2.9 acre site off Campbell Way has planning permission for two buildings that can be split into eight smaller units. With Knight Frank as agents, three units totalling 19,000 sq ft are already under offer. The successful regeneration of the former colliery in Dinnington has transformed it into a thriving business location, home to the likes of Macalloy, Johnston Press and Assured Fire & Security. It also home to a new breed of enterprise at RiDO's Matrix Business Centre. Work began in 2000 on the £14m reclamation project which saw the 85 hectare site eventually developed to provide areas for industrial, business and mixed use and large areas of Urban Green Space. The Homes and Communities Agency (HCA) took over the responsibility for the remaining 17.56 hectares of employment development land on the site. It is the second phase of the regeneration of 34 hectares that has already created over 40,000 sq m of employment space. Fellow Rotherham-based developer, St Paul's Developments is bringing forward a 44 acre site on Todwick Road, adjacent to the existing 45 acre Dinnington Business Park, which already has outline planning consent for industrial usage with plans for "31 East" determining that the site can accommodate a total 750,000 sq ft of logistics/warehousing space with the capacity to develop a single stand-alone building of 450,000 sq ft.
31 East is also set to benefit from being added to the Sheffield City Region Enterprise Zone. The HCA took ownership of the Dinnington site following the demise of Yorkshire Forward. It estimates that 620 jobs have been created so far and expects 2,408 jobs to be created as the scheme progresses. Evolving from a timber merchants, the Waddington's property portfolio was started approximately 80 years ago with the acquisition of a number of properties alongside South Yorkshire's canals network and was added to along the years with a number of investments and land acquisitions. Sites have since been developed by the firm's own construction company and Waddington's local developments include Aldwarke Wharf (pictured), where the latest 41,000 sq ft units are now available and two units are already under offer. The company's first development in the 1950's was for KP Nuts, a canal side development for taking delivery of peanuts at Eastwood.